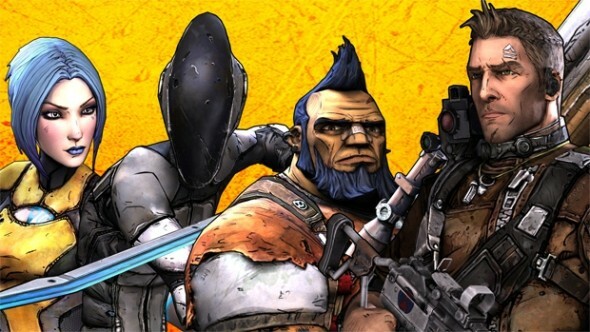 Borderlands 2, the second installment of a line of games called: First Person Role Playing Shooter, with upgrades to your character which make combat and gun slinging that much more visceral. Giving you quite the bang for your buck! 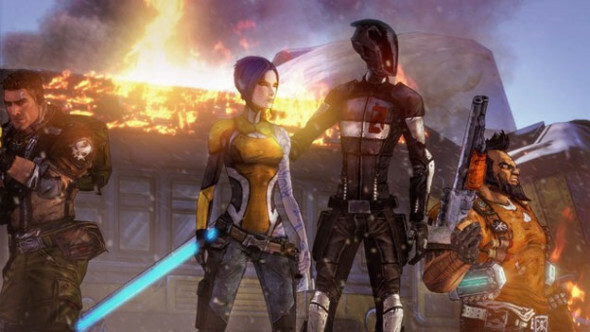 The story so far is this: in the first Borderlands game, you’ve played 1 of a team of 4 different persons, all with different attitudes and gameplay, and you were set on the planet Pandora… a vast ruined lump of a planet, complete with spacedust and ravenous aliens. You get set on a journey by a mysterious A.I. to explore the planet and to uncover ‘The Vault’ a massive place filled with treasure. But when you got there, and opened the vault, only Alienrape Mctentacle came to greet you. Making the mysterious female who set you on this quest come off as the ‘annoying sister’ type. The term: ‘haha made you look.’ springs to mind. After having dealt with the creepy being, the 4 sod the whole business, not wanting another scoop of grand vault filled with alien guts, and so the mysterious woman, turns her attention to another batch of 4 people, or 5 if you want to go: mechromancer. When talking about Borderlands we have to keep in mind this game had 2 choices graphical wise. The themes and story elements can be quite dark, and would set a rather moody, and depressing game experience if they would have chosen for the hyper realistic 3D modeling. However this game chooses for a lighter touch, still keeping the dark undertone intact, but giving it a ‘quirky’ feel, 2k has opted right by going for the cell shaded graphics. 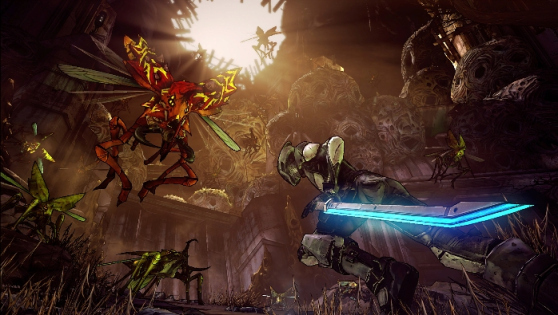 Where Borderlands 1 had little variation in enemy types, this game has a giant encyclopedia on creepy crawlers and brawling baddies to occupy the giant lump of a planet. Speaking of the planet, you won’t be forced to trod in space dirt the whole way through, the planet has opened up it’s vast eco system, and even though you start off in the monochrome ice plains of Pandora, you’ll soon be trodding through marshes, complete with strange flora, often being inhabited by less than friendly fauna, tearing up whole eco systems as you go along. What I’ve noticed about good choice of music in games is that if you don’t pay attention to it, it completely passes you by, but it unconsciously sets you in the right mindset, whether it is you looking down the sights to line up for that headshot, revving up the engine for that final stretch over the finish line, or making sure you’ll make that jump right, so you don’t plummet face first into the abyss. Keeping this in mind, I have to say I had to pay close attention every time I unholstered my guns, and every time I crossed the landscape of Pandora, be it on foot or in a vehicle. But music isn’t the only thing that sets the mood right, having decent voice acting makes or breaks a game. For this instance 2 people come to mind, Claptrap and our antagonist: Handsome Jack. Where to begin, I don’t know which face I want to bash in first, and which of the 2 I would use on the others face. So I have to give props where props is due. Claptrap is vehemently annoying and Handsome Jack is, rude, obnoxious, and doesn’t know how to shut up. And still no matter how dire and dark the message is that this tyrant tries to send out, it comes across as quirky. The writing on this is solid, he comes across as a completely batshit crazy megalomaniac. Gameplay has been ruffled, but not quite shaken to the core. In the previous version there were 4 hunters, all with different styles. Let’s just check up on the difference and cross reference. Roland: a former member of the Crimson lance. Summons a turret and wreaks havoc on the battlefield with guns and pistols. Lilith: A siren, phasewalking is one of her neat tricks, destroys the enemies by sowing the seeds of confusion. Mordecai: A huntsman, when he’s in a pinch he can count on his bird of prey to aid him. Sniping the opposition is the key element to victory. Brick: Big, bad, and burly, plowing through the enemy frontlines with fists and an almighty roar. Explosive weapons make this guy a ‘wham bam, thank you ma’am’ type. In Borderlands 2 these have been reincarnated, but as npc’s but time hasn’t quite done them well. Mordecai has become a hermit for instance. Salvador: a gunzerker, guns, guns, and more guns, and just when you think he’s a walking ammo deposit, he pulls out more guns. He’ll be outnumbered and outmatched, but never outgunned. Axton: the soldier type person, just like Roland, he has a turret as a best friend to help him eliminate enemies and tank the aggression from them. Zer0: an assassin type personality, hidden behind a helmet, wielding a sword to eliminate enemies quickly and silently. Becoming invisible and then striking with a stroke of his blade, or a volley of bullets. 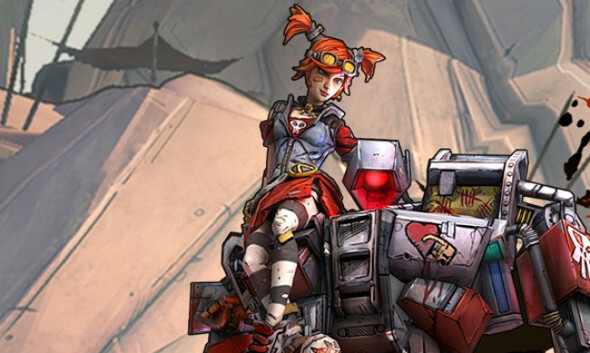 There’s a fifth persona to play with: Gaige, a mechromancer, a small girl has no place on the battlefield you’d think, but her big metallic mech thinks otherwise, don’t let her looks fool you, she’s equally as lethal as her colleague Vault Hunters. I tried my hand at Axton, knowing fully well that I have to someone or something to tank, this is a co-op game after all. I was short on buddies to plonk next to me on the sofa to help me out. So the turret did just as good of a job as another player. After leveling up, I chose for the perks that upped my survivability and the attack prowess of my turret. You have one goal in mind: Killing Handsome Jack, saving Pandora, or more or less keeping it a barbaric dog eat dog place. And finding this mysterious ‘bigger Vault’. You get missions from people in the world, sometimes this can be annoying as you have to retread your steps to the one who gave you the task. I have to say, this game doesn’t let up. The difference in enemies is astounding, and just pulling the trigger until either party stops moving is not much of an option. Some enemies wear shields with more enemies on. A little cruel as they just serve as cannon fodder. Enemies have shields, crystal body armour. But all is not in favour of the enemy. The battlefield has had a makeover too. Oil tanks, electric kegs, forcefields, and slag barrels litter the warzone. Using the environment is one way of weakening the enemy, using weapons with a second damage type does wonders too. There’s different types: Fire, Electric, Poison and Slag. Fire is good on enemies without armour. Electric depletes shields causing your bullets to do direct lifepoint damage. Poison is just an added damage perk. Last but not least: Slag, this makes the enemy take double damage. This comes in extremely handy on the more beefy guys. You’re wondering, so what, a shooter with cell shaded graphics, big whoop. Not quite, this game isn’t just an fps, it’s the second in a new breed of games: RPS, role playing shooter. As you progress on the planet Pandora, you gain experience, and level up, causing you to do greater damage. And doing certain things, like getting X amount of headshots, or X amount of kills with a certain guns, gains you ‘badass’ points, these can be invested in additional stat bonuses, ranging from elemental damage, elemental damage chances, to melee damage, to the accuracy of guns. If I have to give one point of annoyance, then it’d be the vehicle sections… I wonder who thought up those. The cars handle like the newest movie editing software on my computer, clunky, slow and difficult, not to mention this makes the battles in the cars more frustrating. Shooter fans, this will keep you stuck in front of your tv set and console for many an hour, with not just 1 campaign but 4 (5 if you want the Mechromancer.) and added DLC that recently hit the online stores. No doubt about it, if you liked Borderlands 1 then you’ll LOVE this, if you thought the first game was drab and uninspired with the lack of different enemies and same atmosphere everywhere you went, then buy this, because it’s has a plethora of enemies, guns and environments.